Home News Why Should We Support to LGBT Community? 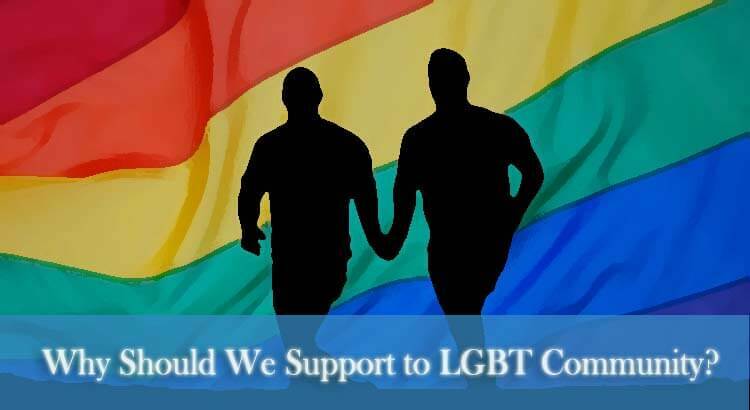 Why Should We Support to LGBT Community? I won’t hurt anyone but I want to tell that why we hate the people of the LGBT community? Why do we think that they differ from common people? Why do we not give the opportunity to share feelings? Why is government rejected every time? Much of the violence they face in common life. In spite of this, they want to live among us without discrimination. But we do not accept them. Why am I think LGBT Community is not a curse? LGBT is not a curse. He is also made by God who makes to all people. We all are the child of God. We all are alive by God. If we cannot give the life to anyone then we have not permission to hurt anyone’s sentiments. Somebody lives to own life as on choice, then why are we not accepting? If any common man and woman make the relationship in public then it’s legal. But an LGBT member makes the relationship, then it’s illegal. Why do we discriminate against them? I’m not a gay, I’m not a member of the LGBT community, but if I can do anything then they are acceptable in society. Why is not for them? Those people are not hurt somebody’s sentiment. But we hurt to their sentiment. It should be stopped permanently. It should be the monitor. Who is misbehaving with them? We all should have rights to live own life. Why Should make Law for them? Lesbian, gay, bisexual, and transgender (LGBT) people face violence based on gender equality. Many times, he murdered by peoples. If I told you that where is more violence happens to LGBT community then it will big issue for me. Because LGBT peoples face violence, mobbing, assault, and lynching in 24 countries, including America, Australia, Iraq, Britain, etc. But still, now there is no proper rule applicable In the country. LGBT people feel too secure as other peoples. Every day, we listen to news of violence against LGBT peoples. But the Government does not take action against them who spreading the hate about innocence peoples. Now, we should make a majority and should be demanded from the government. We should have permitted to complain in police station. We should have the freedom to live anywhere. Discrimination should be permanently removed from society. What LGBT Community Want to Society? I have mentioned earlier. They think same who we think. There is no difference between us. we want to live a safe life in our country. Nobody assaults me, nobody fights me. We should get freedom of speech, freedom to work, freedom to live life. Exactly, the same thing they also want from government and the society. They do not want further. They just want freedom. They all are kind and innocent peoples who given by the God as we. We should support LGBT community and we should participate in their freedom who demands to the government.Thanks to all who participated. Previous article Why We Loves To Watch Movies On HBO Television? How Many US Presidents have been Assassinated? Is it Promise Land or Promised Land? 4 Dimensions of McDonaldization and How it Changed Us! Is an Emperor higher than a King? Is Bulgaria a Part of Russia? Who is the oldest Person to become President of USA?